I am not too sure where this month went. As I sip on my choice of drink, late at night, writing my blog post, I sigh as I see the Christmas boxes are still in my family room. No, not even packed. I still have my decor up! I have been busy with life. As we all are I am sure. Between the school run-a-rounds, homework, refinishing and This Is Us (among some other shows that are on my must watch list) a girl can fall behind. Perhaps a little too behind. Hello February, already!?!?! OOPS. One of these gorgeous antique beauty’s is available for purchase. Click over to Shop Selections to view details. I love this quote. You can apply it to anything in your life, at anytime. 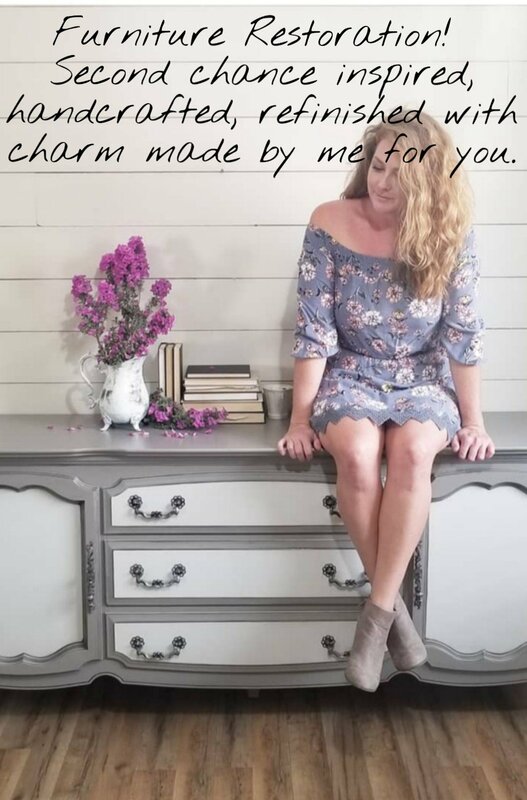 Prepping my furniture so it withstands another life time, being a mother and teaching my children right from wrong, finding friendship and showing loyalty, kindness and lending a helping hand when needed. I give my best in all I do. I may not be perfect, but it is my best, and for that I know tomorrow will be good. As for those Christmas boxes… tomorrow is a new day! I have many projects scheduled in the books for February. Mostly custom, and I am grateful. I will have a few items that will be available for purchase. If you would like to receive what Second Chance Charms has to offer before it goes public, please fill out your email address here: First Dibs Email List. A returning client brought me a French Provincial End Table that needed to go bold and beautiful. She is in the moving process and wanted to go bright in her new home! The before pictures may look familiar, its a piece I had refinished a long time ago. During his move, the handlers got a little careless. I had to fix the darwer, as it was cracked from something heavy falling on him. Refinished in Sherwin-Williams Tangerine and lightly glazed in Turkish Coffee brown. Hardware revamped in bronze. I am just head over heals for these pieces! So much character and color! The best part, one of them is for sale, click over to Shop Selections to view details! Oh my goodness. I love when client’s want to give their littles a Second Chance. This KidKraft Retro Kitchen is super adorable. Remember the Playhouse I refinished last year? Check out the debut here: Playhouse Flip. This KidKraft Kitchen will go with its little house. Refinished in Sherwin-Williams Tidewater and all hardware and extras revamped in Nickel and White. I was so excited to find this antique china cabinet. I love unique pieces and want to be able to refinish more of them. I have a hard time finding them on the west side of Arizona. I went to Pinterest to find inspirational photos to give me an idea of what I wanted to do. At one point I was toying with the idea to go bright and bold, but caved when I thought of a two toned look for this gal. This gorgeous curio cabinet has curved glass and a backsplash beveled mirror. Carved lion claw feet with original casters. Refinished in Sherwin-Williams Amazing Grey and glazed in a dark grey glaze to pop out all those fantastic details. Inside has three removable display shelves that are refinished in Sherwin-Williams Greek Villa. All original casters and knob are revamped in Nickel. She is available for purchase please click over to Shop Selections to view details. Before and after photos. This poor gal came to me with a broken foot and a missing glass door. Looking at the final photos, would you never be able to guess that. Love how she turned out!